Live feed awaiting arrival of royals. Whilst I'm very interested in the Royal baby news I'm watching the Open Golf Tournament and the Ashes Test Match on TV today so may miss the arrival at the hospital ! So much happening here in UK at the moment. I hope it's a girl to follow on after two male Sovereigns. Unfortunately I won't be around to see that happen. Good luck to the whole Royal family!! None of us probably will, Jo. We'll be observing from another dimension. I hope it's a girl too. But isn't the succession to the throne still male preference cognatic primogeniture? So if they have a daughter now, & a son later on, he precedes as future sovereign. I hope the monarchy phases that sexist statute out. Another heatwave on approach this week, I hear. Hi Juliette, I think around September they were trying to rush through an act to end succession. BUT you know me it could have been a dream. The laws will be changed to accommodate a female heir so if Kate has a girl first then a boy, the girl will first in line to the throne, about time too, considering the current Monarch is a female! She went into hospital at 6 am. At 8.30am a spokesperson said "things are progressing as normal"
Kate's having a cushion! I don't believe she's actually carrying. There has been so many instances where the reporters have said weird things, not normal pregnancy stuff, that I'm sure a surrogate is having the baby for her! Sorry to offend any royalists, but there's something not quite right here! JMO! A medical team with extensive professional experience and knowledge of the royal family will look after the Duchess of Cambridge during the birth of her baby. Marcus Setchell, who was the Queen's gynaecologist for two decades, is in charge of the care Kate will receive and helped save the lives of the Countess of Wessex and her eldest child Lady Louise Mountbatten-Windsor in 2003. Sophie was rushed to hospital after complaining of severe internal pains when she was eight months pregnant. She was dangerously ill from blood loss and doctors performed an emergency Caesarean. Lady Louise was born weighing just 4lb 9oz and transferred to St George's Hospital for specialist care while the Countess remained at Frimley Park Hospital in Surrey, spending six days apart from her daughter. Lady Louise was the first grandchild of the Queen to be born on the NHS. In December 2001, the Countess was airlifted to hospital after suffering a potentially life-threatening ectopic pregnancy. In 2004, Mr Setchell was made a Commander of the Royal Victorian Order (CVO), a prestigious honour in the Queen's personal gift. He also assisted with the Duchess of Cornwall's hysterectomy at King Edward VII's Hospital in 2007 and delivered Sophie's son James - Viscount Severn - the same year. He looked after Kate when she was taken to hospital with severe morning sickness in the early stages of her pregnancy. Mr Setchell is being assisted by Alan Farthing, the former fiance of murdered TV presenter Jill Dando and the Queen's current gynaecologist. Mr Farthing, who has been a doctor for 26 years, works at Queen Charlotte's & Chelsea Hospital in Hammersmith, west London, and St Mary's Hospital in Paddington, west London, where Kate is due to give birth in the private Lindo Wing. 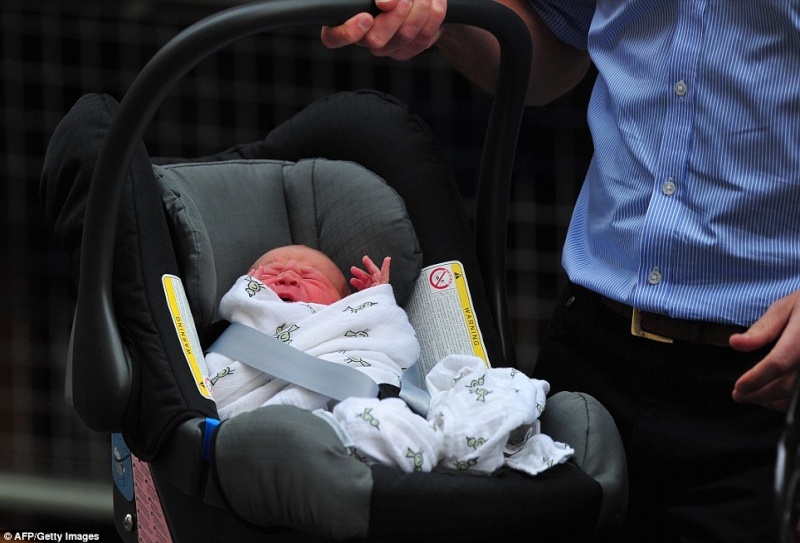 He became the Queen's gynaecologist, taking over care of royal mothers, in September 2008 and Kate's baby is his first high-profile royal birth. The consultant gynaecologist, who qualified at St George's Hospital Medical School in Tooting, south London, also works privately at King Edward VII's Hospital, the Wellington Hospital in north London, St Mary's Lindo Wing and Harley Street. He is a specialist in fertility sparing surgery, keyhole surgery, gynaecological cancers and endometriosis. Mr Farthing was engaged to popular BBC presenter Ms Dando when she was shot and killed in April 1999. He found love again with fellow doctor Janet Stowell. They married in 2008 and have a young son. Hope she can hang on 'till after midnight....NEVER met a LEO who wasn't regal...job done. Ten hours now....no news yet ! IT'S A BOY AT 4.24 pm.......8.6oz !! How Sweet! I bet on "George" for the name. Lucky couple have had a baby boy. Natural birth too. 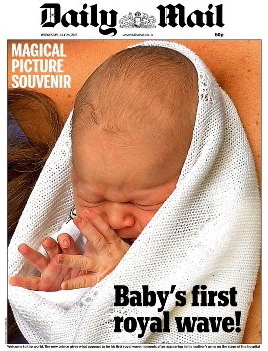 Prince George is a likely name. Wonderful - can't wait to see. Tomorrow they say. Kate will stay at her parents home with the baby for a few weeks. I like the way this modern couple are doing things their own way instead of following old royal protocol. Parents have visited and said " he's a beautiful baby"
is anyone able to post the daily mail one of him crying in his car seat? William said..."He"s got her lips fortunately." He drove them off in the Land Rover. 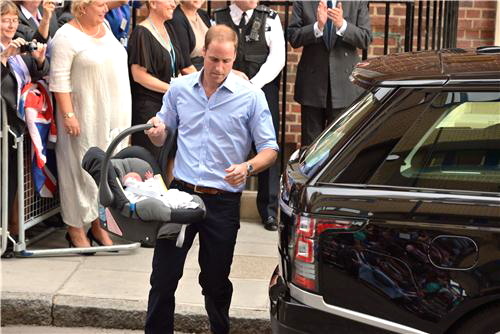 Judging by body language, I think William is going to be a fiercely protective daddy. 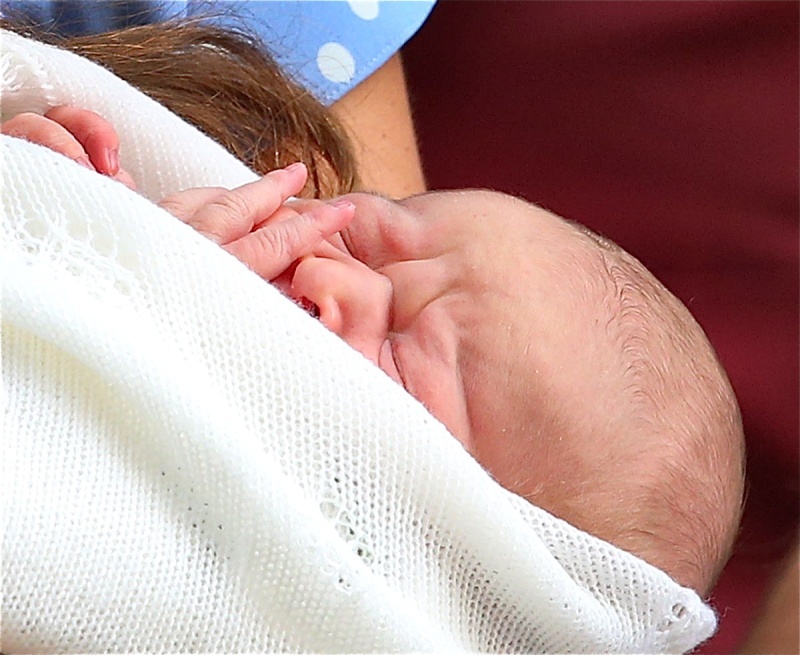 Not sure who'd nose the baby got, but I can see William's chubby cheeks! 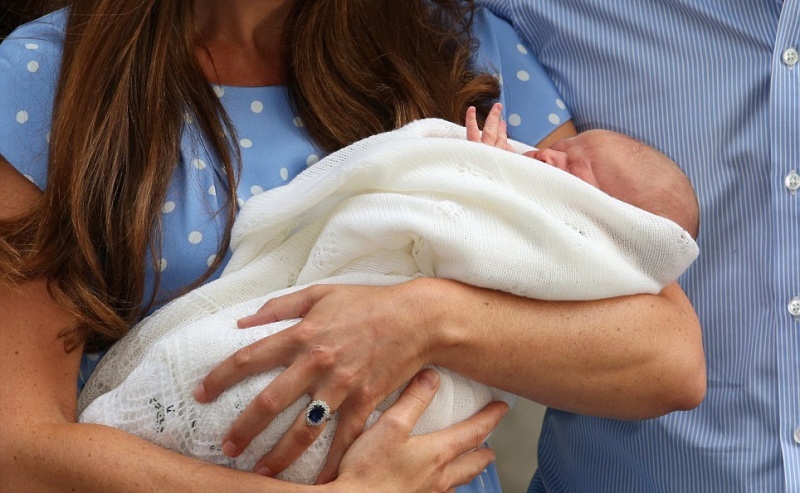 The Queen must be quite taken with Kate to change hundreds of years of policy by changing the rules of succession just for this little baby. Wishing the new royal family all the best. It will be fun watching Kate and William's children grow up. I think William is his own man. Being a helicopter pilot for Air sea Rescue service is a very manly profession ! CAN YOU BELIEVE DIANA WOULD HAVE BEEN A "GRANDMOTHER"
I am absolutely sure she is so proud of ALL THE FAMILY TODAY. I just saw side by side photos of Dianna and Kate holding their babies. It looks like they are using the same blanket. Both women wearing poka dots dresses. Truly sweet. Yes, it was a sweet moment. Kate looked radiant. William looked entranced. I'm glad they're not forgetting Diana in this moment, she would have been such a great grandma. Thanks for posting the pics and the video Joanna. Amazing So happy for them. 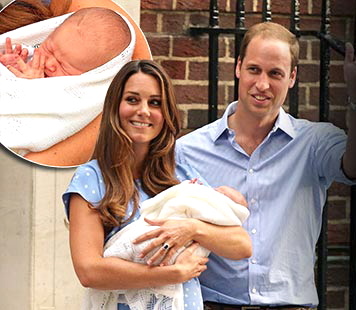 That is such a cute baby , l hope the best for the three of them , conglatulations to both William and Katherine . Wow thanks for all the pictures and videos. 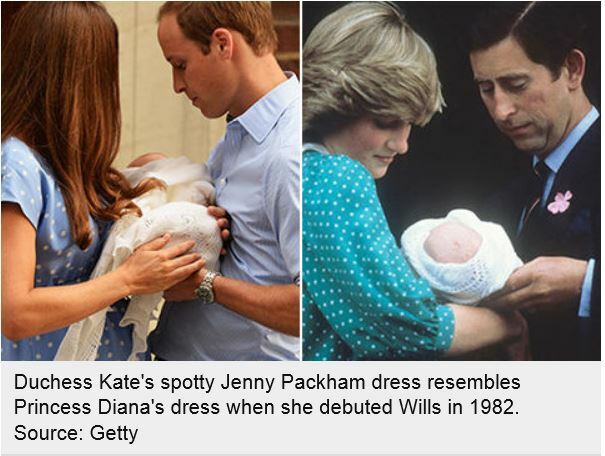 That is such a lovely tribute to Diana, the polka dot dress and the same blanket. That is just so, so sweet. I do like how the British monarchy institution is progressing & adapting to modern times. Sure, it keeps its traditions & pagentry, which is part of its heritage. Like the town crier, etc. I like the fact that the male primogeniture rule was eliminated. I also especially admire that the spouses of the heirs to the throne of two of Europe's oldest royal families, Denmark & Britain are from humble, commoner lineage. Gone is the tradition of "blue blood" exclusivity. Princess Mary of Denmark married Denmark's heir to the throne after she met him at a pub accidentally in Sydney in 2000. Just a simple, independent, educated Australian gal, who was working at a real estate agency. They fell in love at first sight, they claimed. Then, of course, Kate Middleton. From humble roots whose maternal lineage includes coal miner & factory worker grandparents, & a flight attendant mother. Kate proved herself a very elegant, composed & refined lady, fit for a king. She's beautiful, confident & above all, has a genuinely sweet & kind disposition. Just like Princess Mary of Denmark. In both cases, love entered the equation. The Establishment is progressing with the times. Who knows what lies ahead for this young Prince? He sure looks like he'd like some peace & quiet.